Awaited or not, Microsoft‘s Spring Creators Update is yet to come in late March or beginning of April. Codenamed Redstone 4, the Spring Creators Update is the latest Windows 10 OS version 1803. The tech giant is currently working on a full swing to finalize the new build, which is expected to be rolled out to Windows Insiders by the end of next week. Unlike previous Windows 10 builds, a.k.a. Anniversary Update and Fall Creators Update, Redstone 4 will not exhibit a multitude of the new feature. This time, developers aim at making the operating system as stable as possible. Despite the fact that it‘s a stability update rather than the feature, there is a handful of notable features. Windows 10 enthusiasts point out to renewed HDR Support; Fluent Design Changes a new Timeline feature as being much anticipated. Timeline. Windows 10 Redstone 4 will feature improved Task view, which will allow monitoring the activities preciously performed on the system and re-enable them if needed. This update will minimize the risk of loosing some previously done work. Spring Creators Update will feature more fluent design. It will focus on light, depth, and motion. In comparison to the older versions, it will be the most modern design encompassing many layers, highlighting effects, and semi-transparency feature. Near Share feature. This new feature is similar to Apple‘s AirDrop. It enables file sharing on multiple devices with enabled Bluetooth and Near Share feature. Microsoft Edge. The Microsoft‘s web browser like usually is going to be supplemented with some new features. This time, it will allow running Progressive Web Apps (PWAs), which behave like desktop apps. Each Edge app, therefore, will get its own window and taskbar shortcut. Redesigned Hub (bookmarks, history, downloads, eBooks, etc. ), auto-fill in forms, syncing saved information across devices, Mute Tab, new full-screen mode, clutter-free printing option, improved Reading View, are some of the other Edge update improvements. Font management feature. Settings app will include new Fonts screen option, which will be available in Settings -> Personalization -> Fonts. Clicking on the „Get more fonts in the Store will open the accessible Fonts collection. Cortana. Microsoft adds Organizer interface under the Notebook to view the lists and reminder. My People, a feature rolled out in Fall Creators Update, will allow drag and drop contacts to re-prioritize them. Action center changes. „Expand,“ „collapse“ and „see more“ options added. Two finger swipe gesture to dismiss Action Center pop-ups. Taskbar features the Acrylic blur effect. Renewed Action Center design, „clear all notifications“ option included. Quite hours replaced with Focus Assist. Documents and Pictures available from Start menu. Windows Hello can now be set up on the login screen. The list of improvements is not definite. You will be able to test everything by yourself soon after Spring Creators Update will be rolled out. 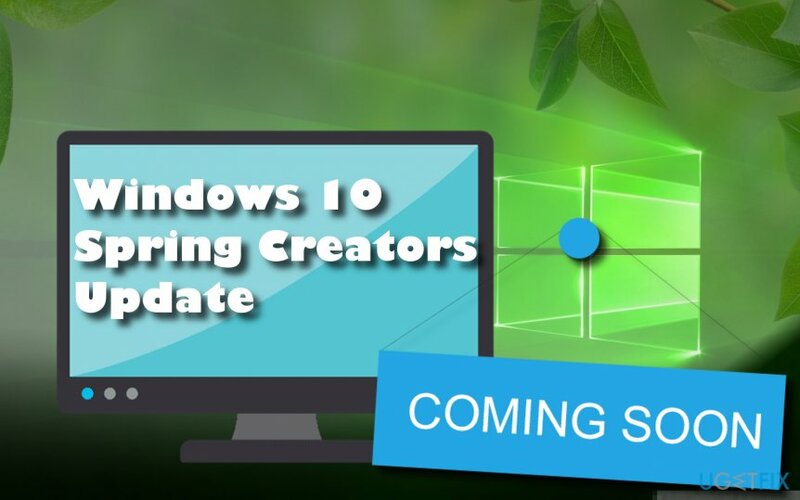 Just like Anniversary update and Creatures Update, Spring Creators Update will reach home users in certain stages. Windows Insiders are the first ones to test the new features. The role of insiders is vital since they allow Microsoft to know about the bugs and shortages that can be fixed in advance. The first rollout phase will reach newer devices with the pre-installed Windows 10 OS. It is expected that Windows 10 users will be able to upgrade within two months (within April and May). Once your device gets the update, you will see a pop-up notification at the bottom-right corner of the screen. The pop-up will report that the Windows Feature Update is available to you. Users will be able to install the update not, schedule a time to install it or receive a reminder within few days. If you don‘t receive the update, you can always go to Settings -> Update & Security and click Check for Updates. This option can accelerate the reception of the Windows 10 Spring Creators Update. Install all pending updates for the current version of Windows (Settings -> Update & Security -> Check for Updates). ^ Joe Osborne. Windows 10 'Spring Creators Update' may be its first big patch of 2018. Techradar. The source for tech buying advice. ^ Rafia Shaikh. Windows 10 2018 Will Be More Refined Thanks to Fluent Design Implementations – Leak. Wccf (Where Consumers Come First) tech. A leading technology publication house. ^ Gregg Keizer. Top web browsers 2018: Microsoft walks the road to browser irrelevance. Computer World from IDG. This entry was posted on 2018-03-15 at 06:53 and is filed under News.